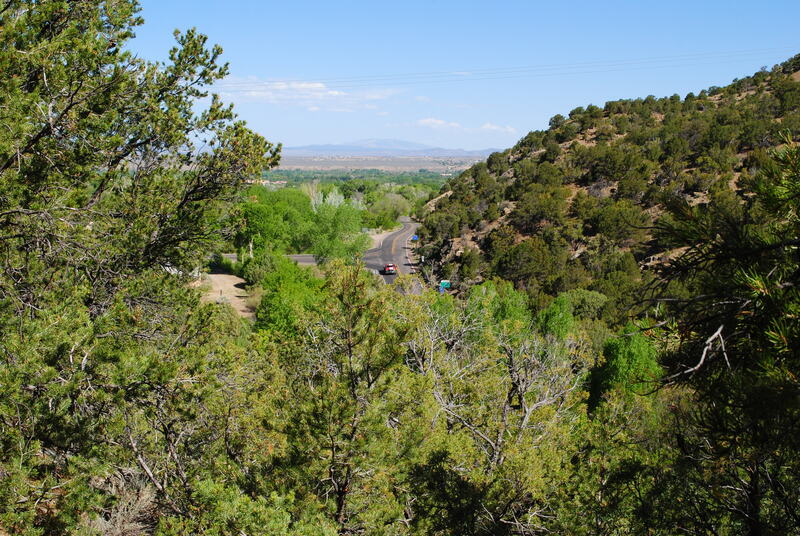 Over the Memorial Day weekend the whole Taos, and Questa, New Mexico area was overrun with motorcycle riders to the tune of 20,000 bikers descending upon this area. Good for the economy, but that did add to the already busy holiday weekend traffic for the area. So of course, the last thing we wanted to do was get out and add to the traffic congestion. 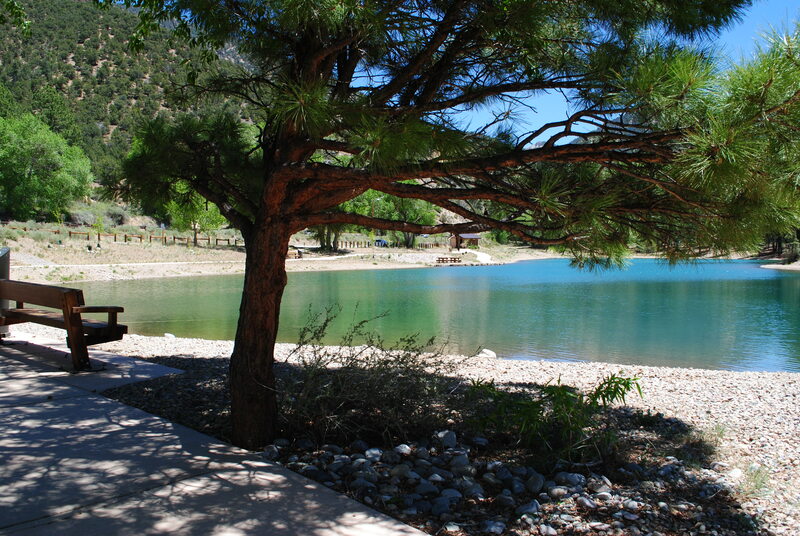 We decided to stay put, and just hang out at the RV Park. But, whatever was I going to do to keep myself busy and entertained? 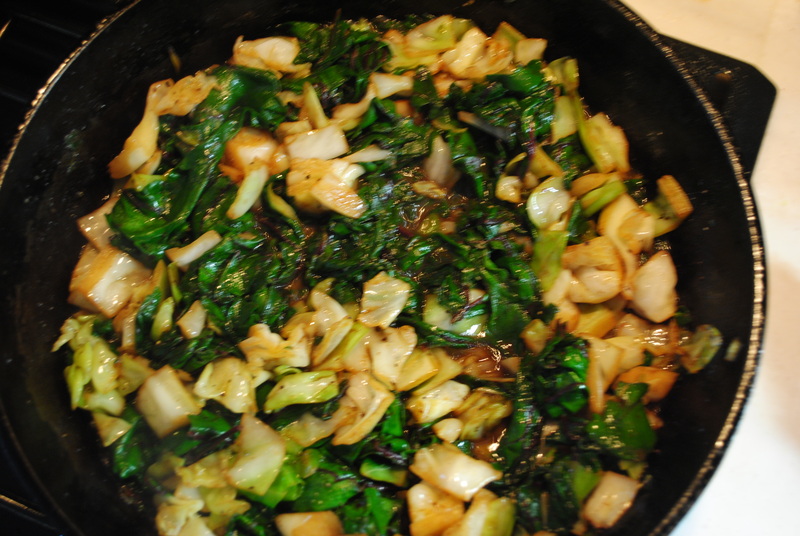 Well, I did what I love to do best… I cooked. 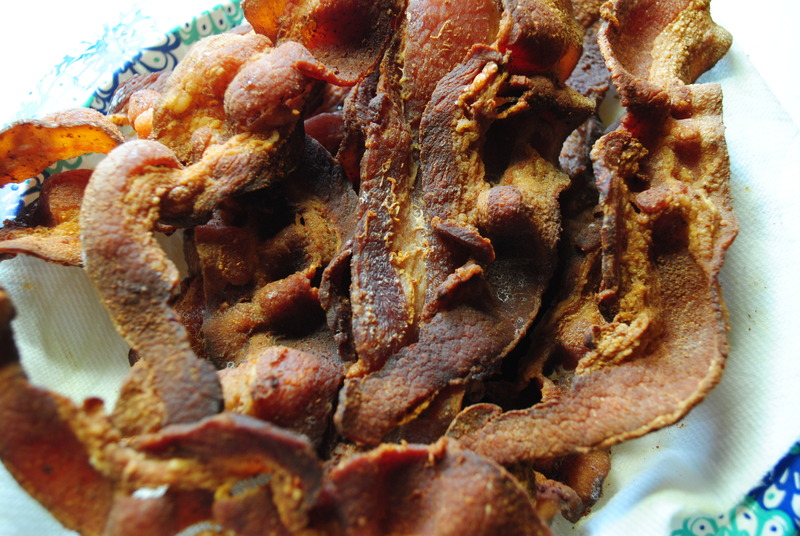 and fried up a batch of crisp bacon to sprinkle on top of those dishes just before serving. 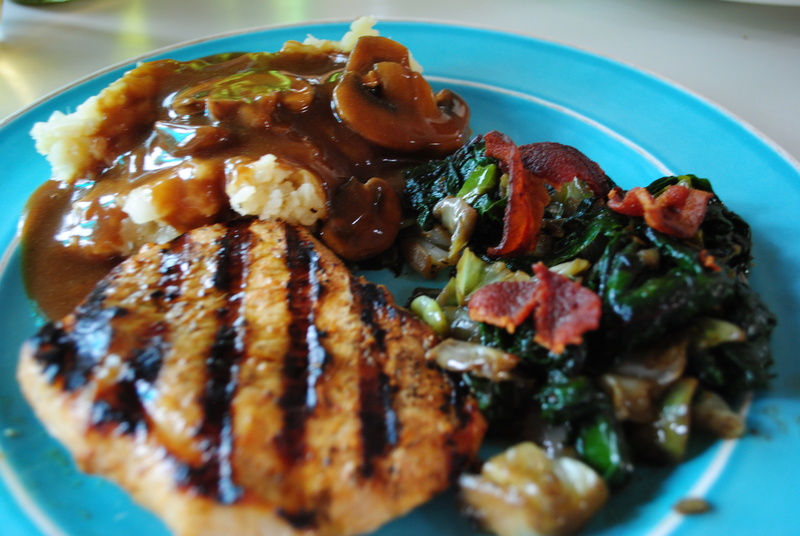 On Saturday evening Bill/papa grilled pork chops, and I served them with mashed cauliflower, with homemade mushroom gravy, and the sautéed cabbage and beet greens. YUM! 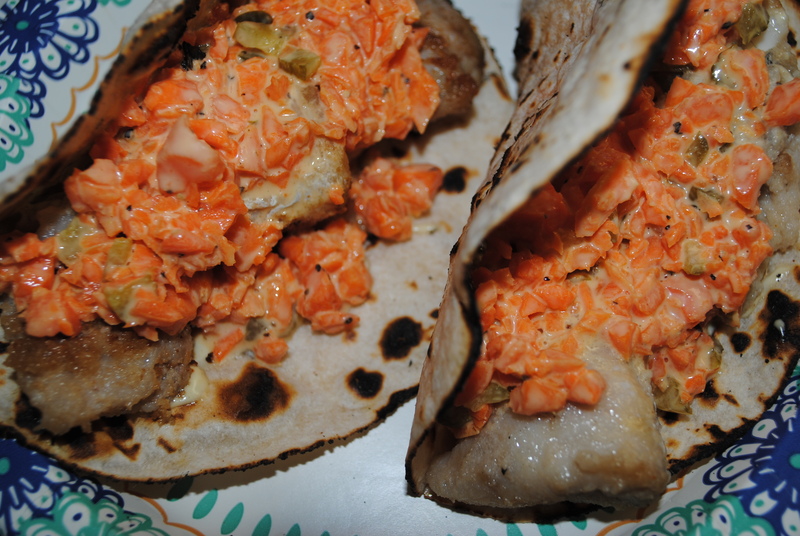 except that paleo catfish was the nastiest thing we ever made, and I could not even begin to gag it down. Bill, on the other hand, didn’t like it either, but managed to eat most of his. That boy has to have a stomach that will tolerate anything, even if he doesn’t like it. 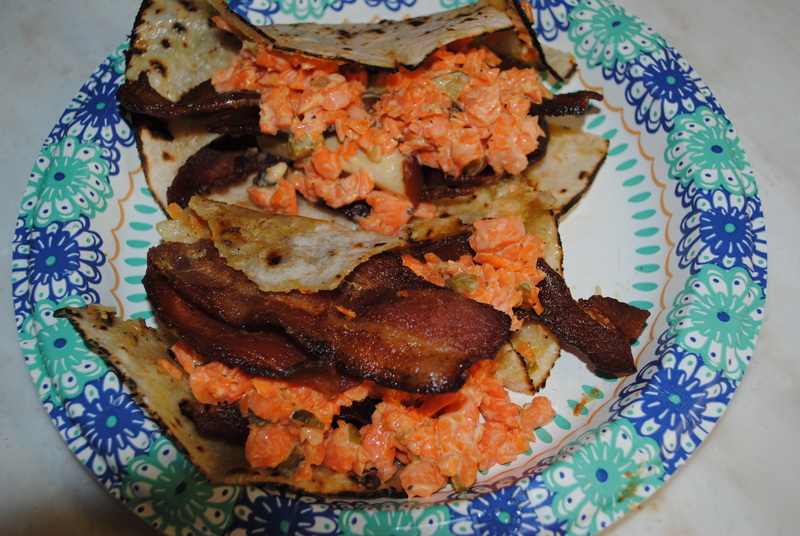 Not me, I not only dumped the catfish out of my tortilla, and replaced it with some bacon I already had fried up, I dumped the rest of the package of frozen catfish as I wasn’t about to try making anything “paleo friendly” with it again anytime soon. Again, it’s good to have a plan (B). 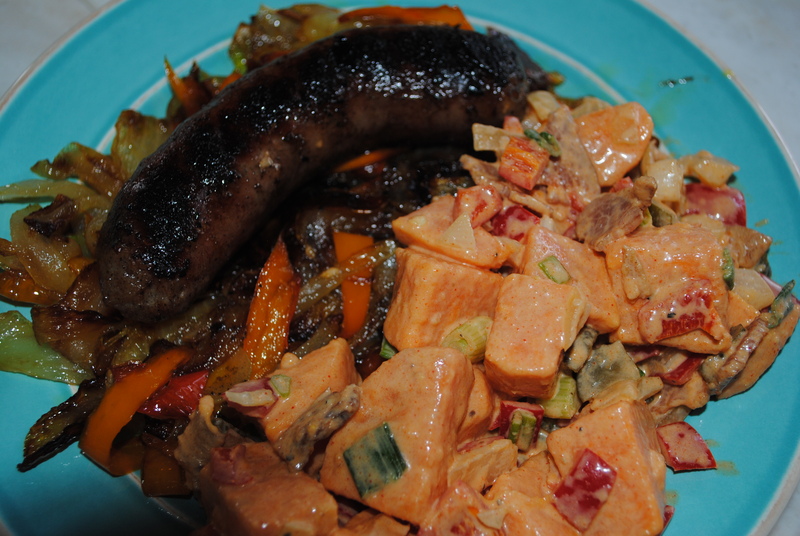 On Monday, Bill/papa grilled brats, and I served it with grilled onions and red peppers, and the sweet potato salad I already had made. Winner, winner, fabulous dinner. In the end, over the weekend we made three meals. Two of those meals were delicious, and one that I considered a complete disaster. Some might say two good out of three is not bad. I say one bad out of three, is still BAD! 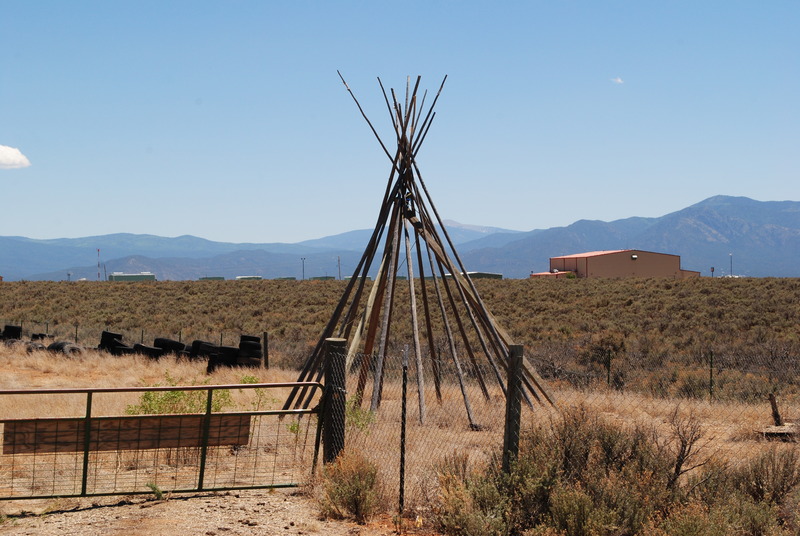 Tomorrow we will go grocery shopping in Taos. 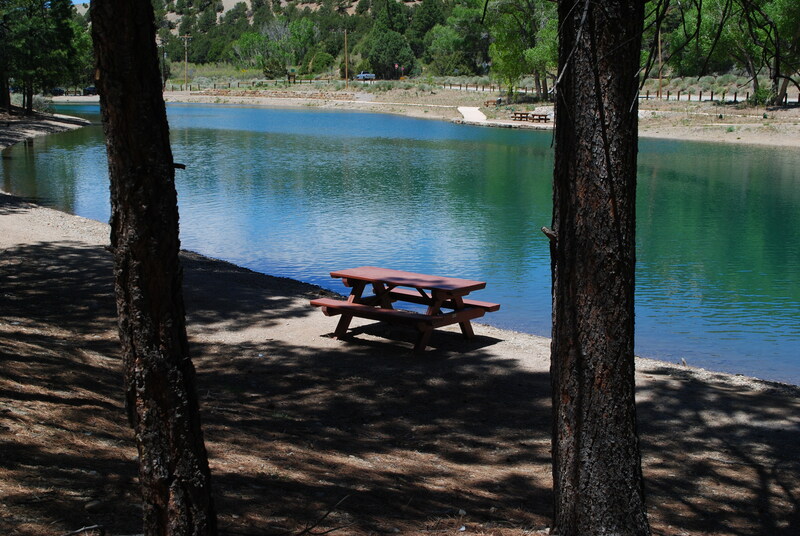 Thursday we will spend the day packing up, and Friday we will move on down the road to Antonito, Colorado. 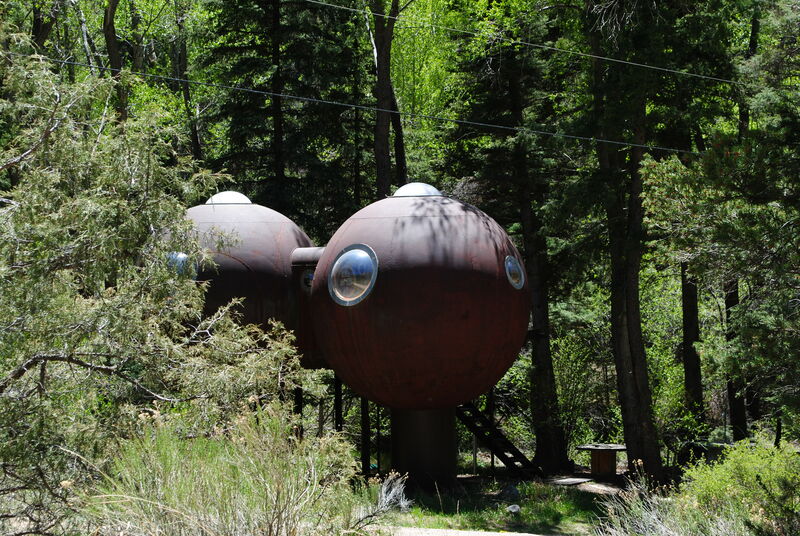 On our way to visit Echo Amphitheater this week, we saw some strange-looking buildings out in the middle of the desert, and I wondered what they were all about. 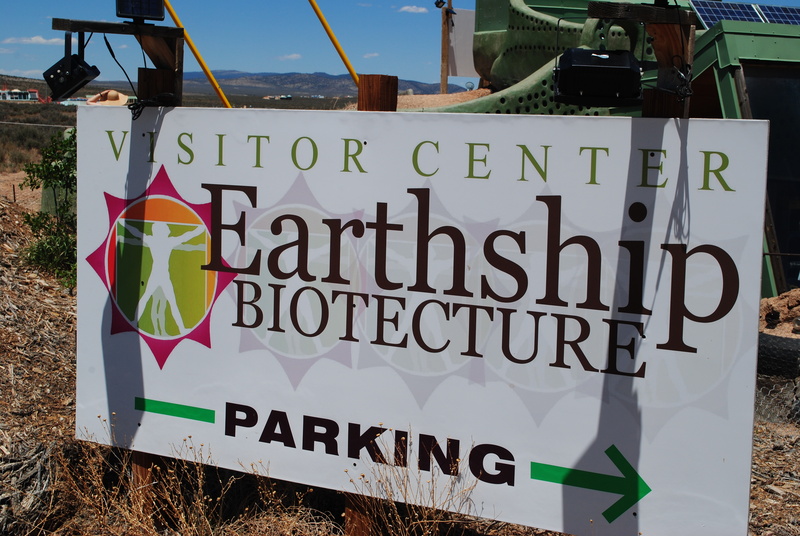 So, on our way home, we stopped to investigate, and found out they are part of Earthship Biotecture. 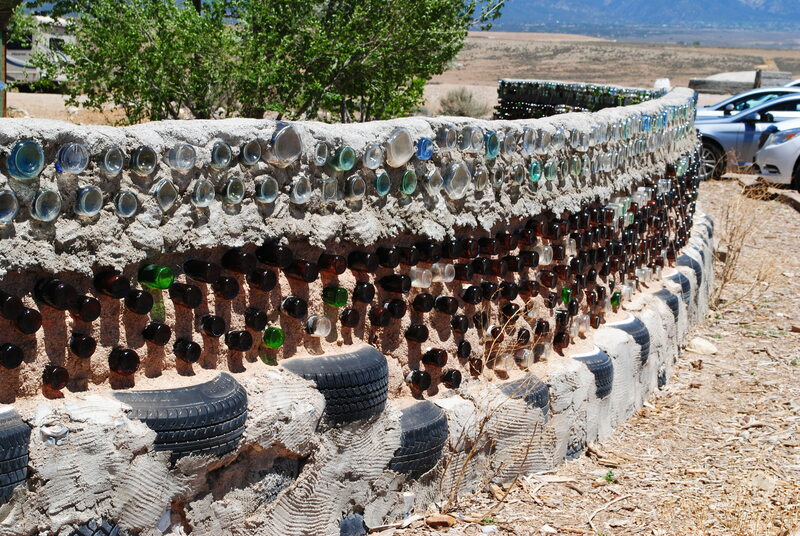 and recycled bottles and cans for interior structures. Buried cisterns collect melted snow and rain, and the filtered water flows through sinks in the bathroom and kitchen. Each abode contains its own greenhouse, and blackwater, from the toilet bowl, hydrates the yards of the 70 residences. If you see a tropical bloom in that area of the New Mexico desert, you can lay your thank-you flowers before the porcelain throne”. 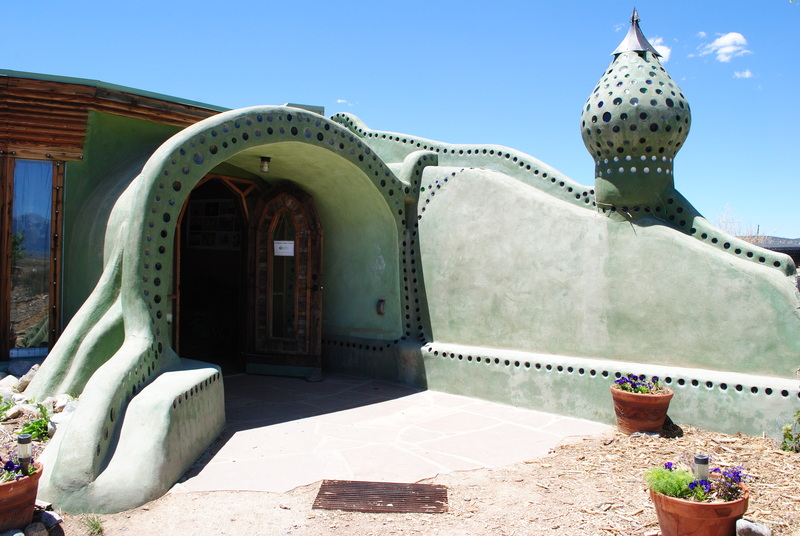 Apparently there are Earthship communities all over the country. Who knew? 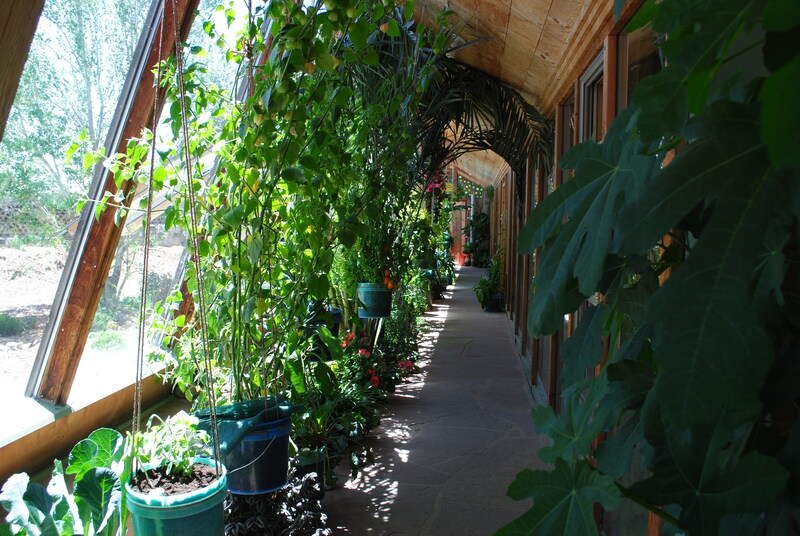 This particular Earthship community offers internships that last 3 weeks, and they teach you all about how to build your own Earthship abode. They advertise the internships as “be prepared for serious fun”. You can also rent a room for the night in one of the main structures if you want to experience a glimpse of what it’s like to live there. For 1-2 people it costs $245 per night. 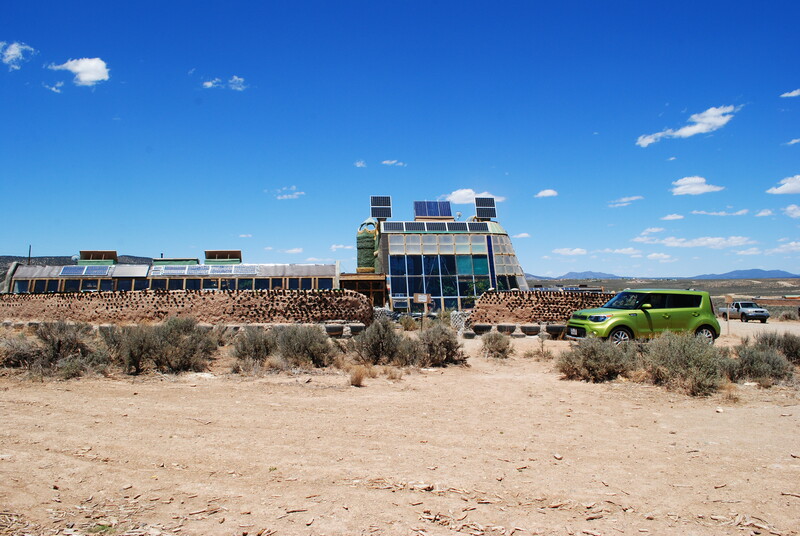 If your interested in learning more, just google Earthship Biotecture, in New Mexico, and you will be able to see actual pictures of how the abodes look from the inside. They really are nice, and very interesting. Our time in New Mexico is quickly coming to an end. 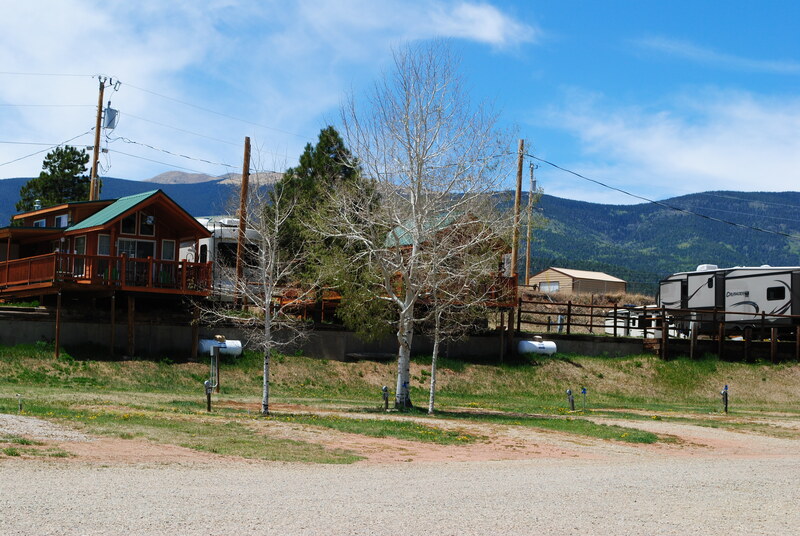 We will leave on June 1st for a month stay in Antonito, Colorado. 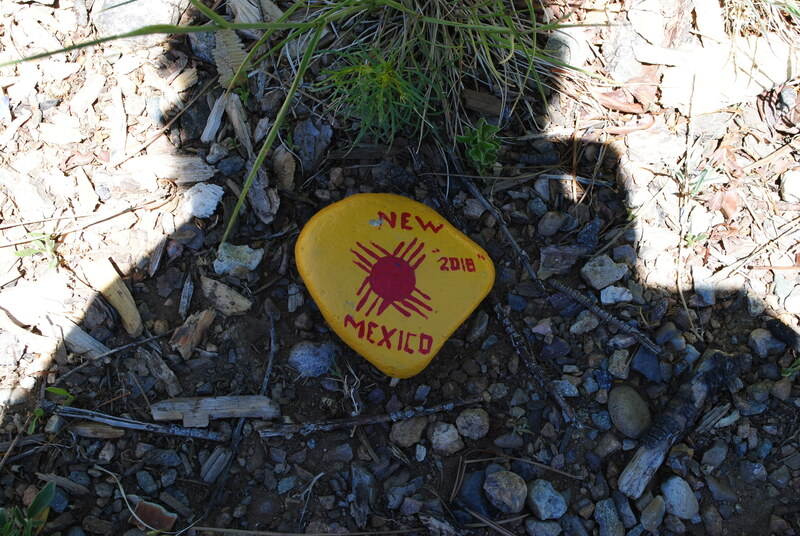 We so enjoyed New Mexico, but we are now ready to move on, and see what all Colorado has to offer. If you’re traveling with us, via this blog, I hope you enjoy sharing our journey. I love having you along, and especially enjoy your comments. 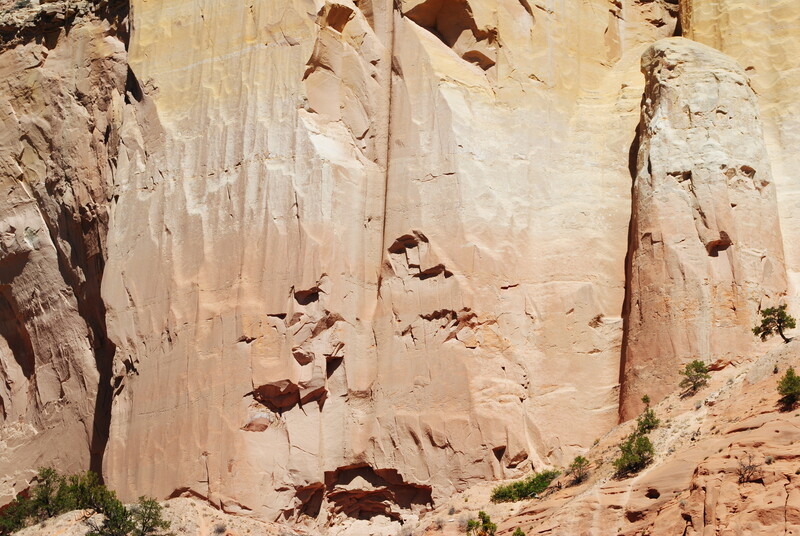 Yesterday we visited Echo Amphitheater. 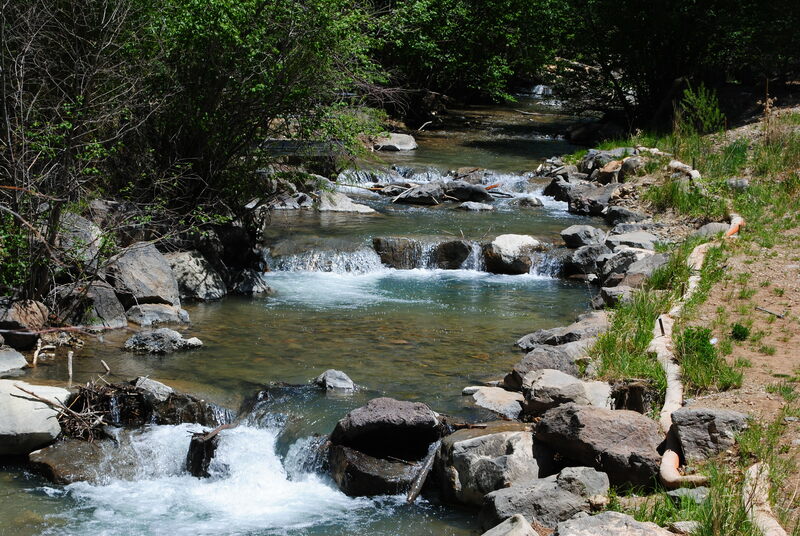 “a natural amphitheater located in Rio Arriba County in northern New Mexico, about 17 miles west of Abiquiu”. The drive there was absolutely beautiful. 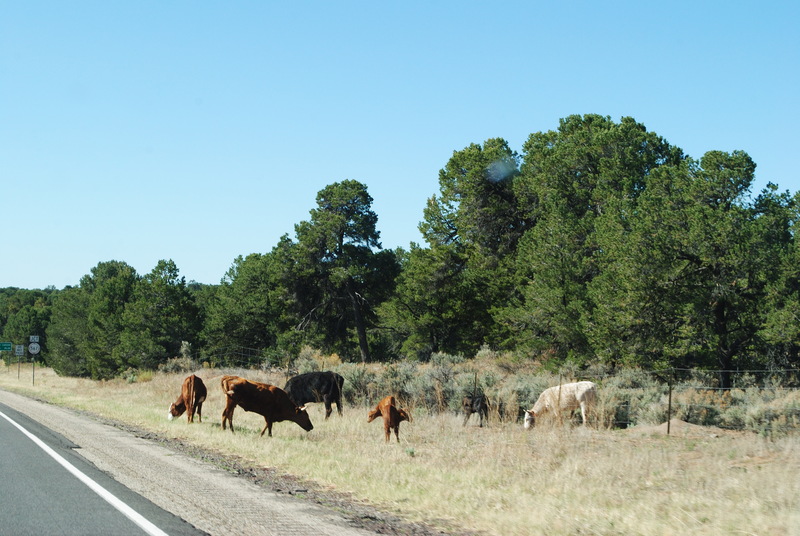 We didn’t see any Big Horn Sheep, or Deer, no, this trip brought us up close with roadside COWS! There they were, just grazing along side of the highway. That’s when I knew we were in for an interesting, and fun-filled day. 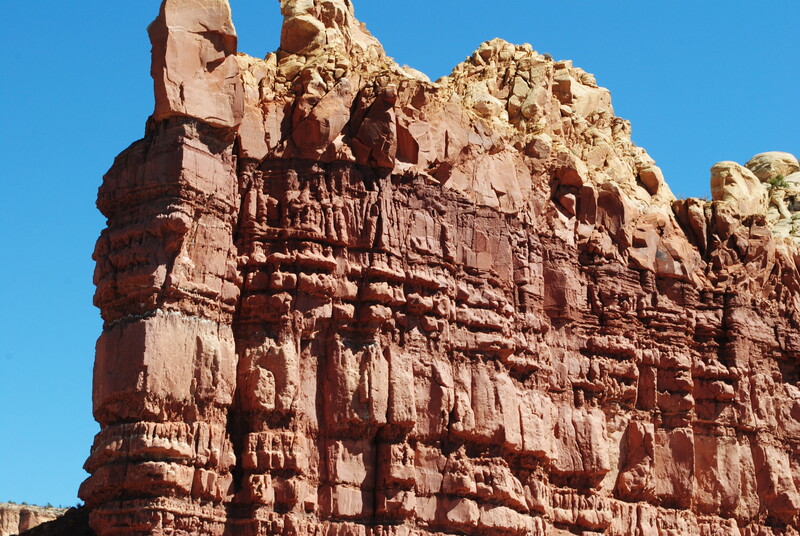 and the way the wind is ever-changing the rock formations. 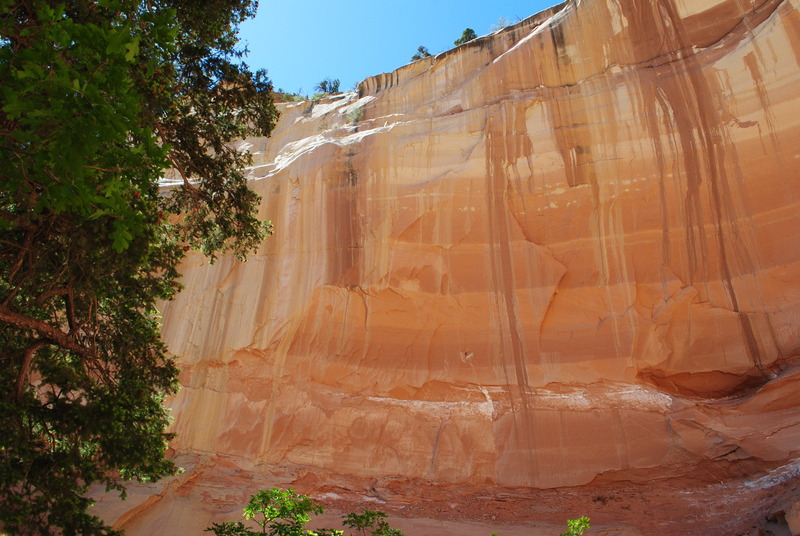 When we finally reached the entrance to Echo Amphitheater, the colors in the stone walls were even more vivid and stunning. and even an open mouth with just one tooth showing. I continued to study the stone walls, and started seeing more subtle images, like this image towards the bottom of the stone wall, that to me, looks like two people standing side by side with head covers or hoods. 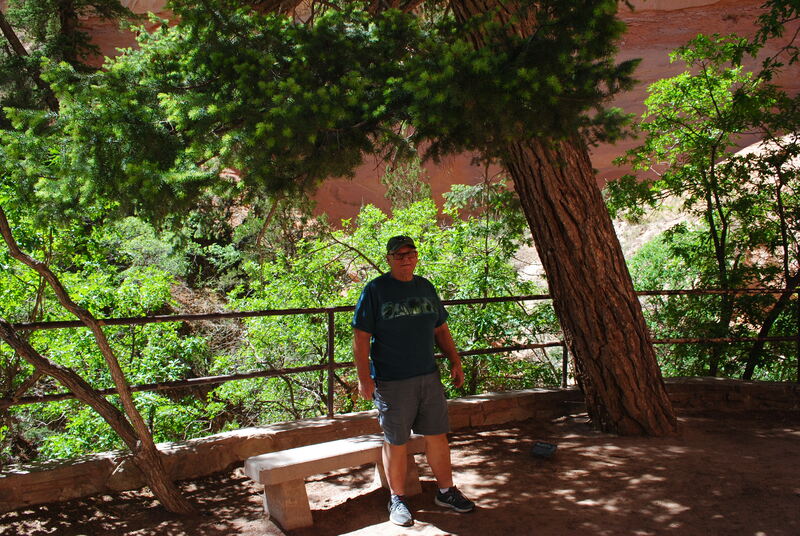 The most amazing image I saw was in the amphitheater itself. 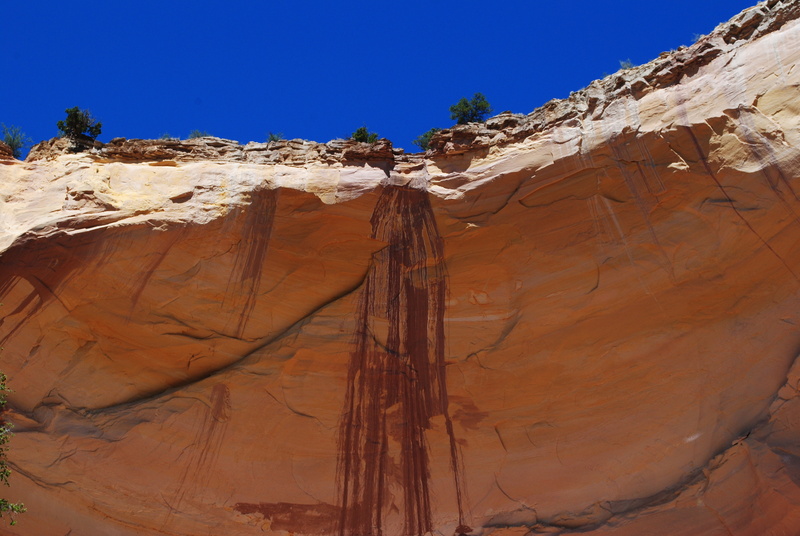 The reddish color that appears to be running down the stone wall, looks to me, like a veiled woman. You might see her too if you follow the deep line in the stone wall (to the left of the reddish color in the middle of the picture) up to where the line meets the reddish color, and perhaps you will see her shoulder, then her neck, then just above that, I see her chin, nose, and the top of her head all of which is covered in a veil, and she is looking to the left as well. Can you see her? I could have stayed there for hours just studying the stone walls. but leave we must, but not without tucking the memories of this special place into my heart to carry with me. 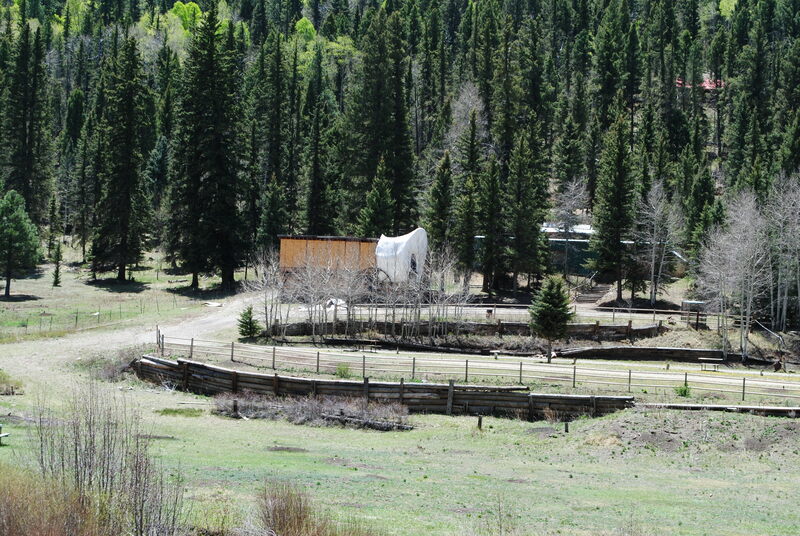 Good-bye Echo Amphitheater. Thanks for letting me see your spirit within your stone walls. 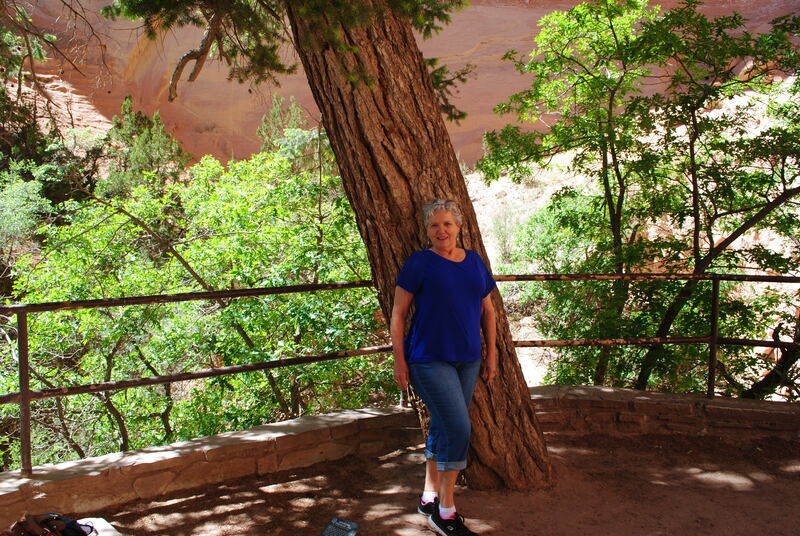 Big thank-you to my frissy, Robin, for telling us about this magical place. We most likely would not have ever known about it if not for your suggestion that we go there. It really isn’t very well advertised. 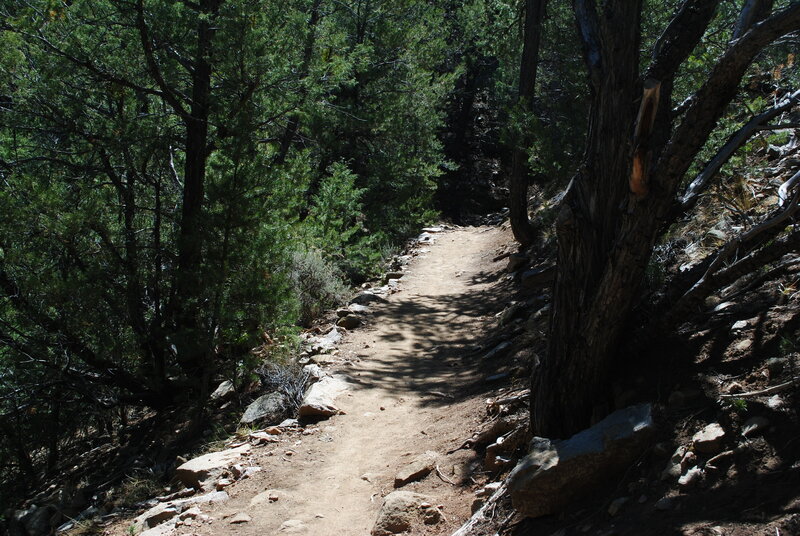 We finally found a hiking trail, that I was able to do in this altitude, that was both fun, and beautiful. 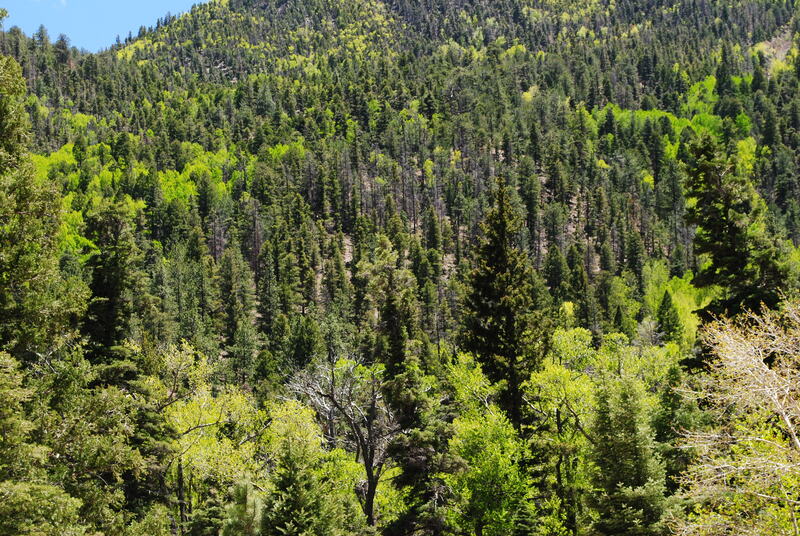 The South Boundry Trail #164, just outside the Taos city limits. 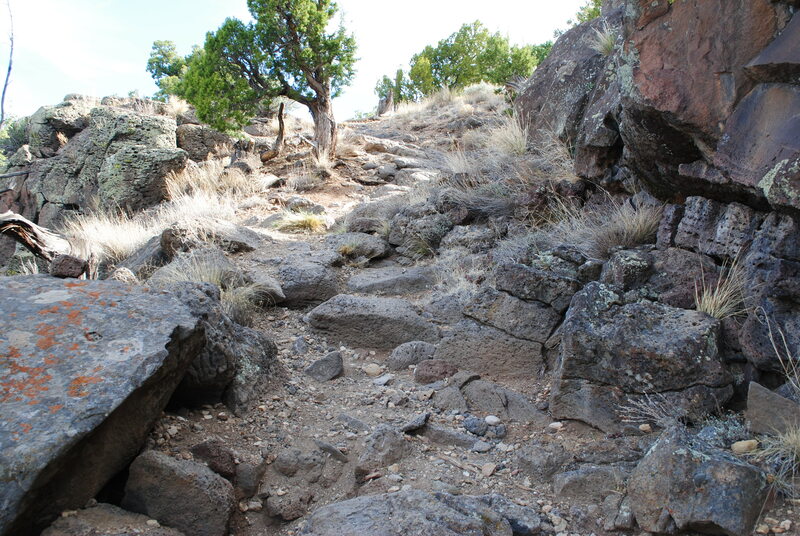 This trail is 20.8 miles long, and climbs steadily, but not straight up like the last hike I tried. and there are plenty of opportunities for you to just pause, and take in the beautiful views from high up in the trees. 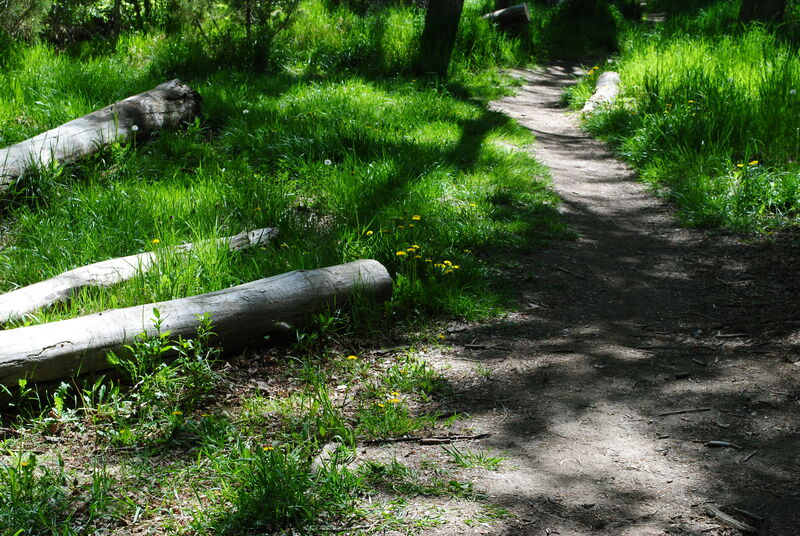 This trail also has many spots where you can take a real break, sit in the shade and talk, or just sit and think about how grateful you are to be able to get out and hike on such a beautiful day, and in such a beautiful place. 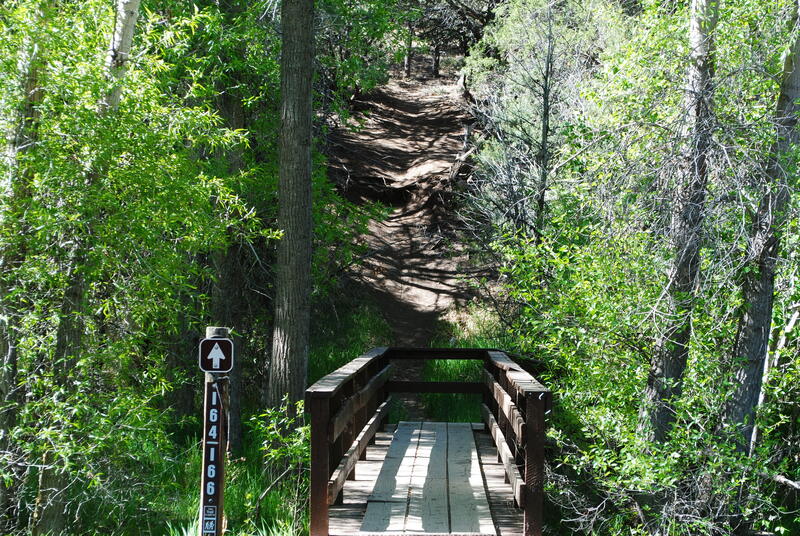 The information on this hike says ” The trail climbs steadily. 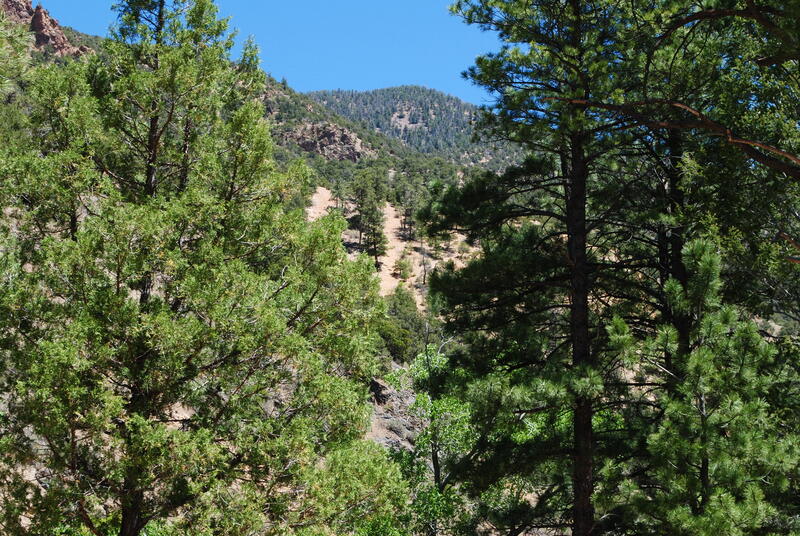 Starting in low cottonwoods along the Rio de Don Fernando, and climbing up through the Pinon-Juniper woodland, Ponderosa Pines, Aspens, and even above treeline on the way to its’ highest elevation of 10,770 feet, just south of Osha Mountain. 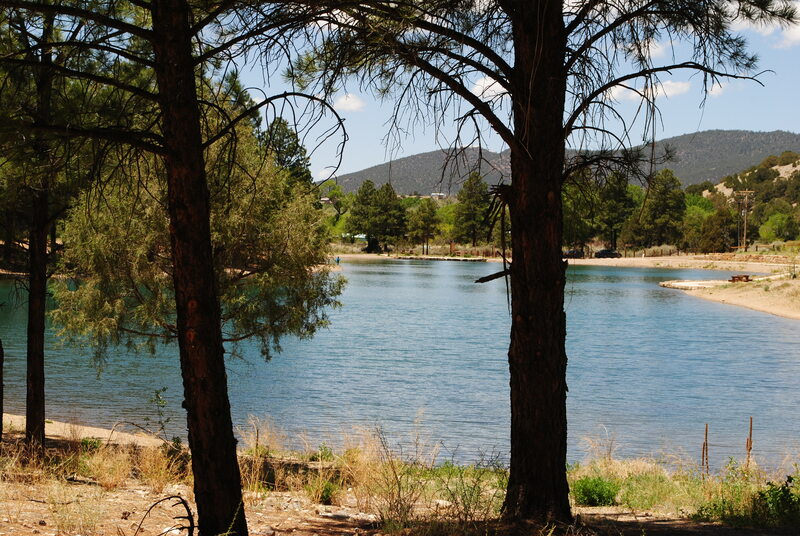 The trail is a highly sought after mountain bike experience with many possible variations. 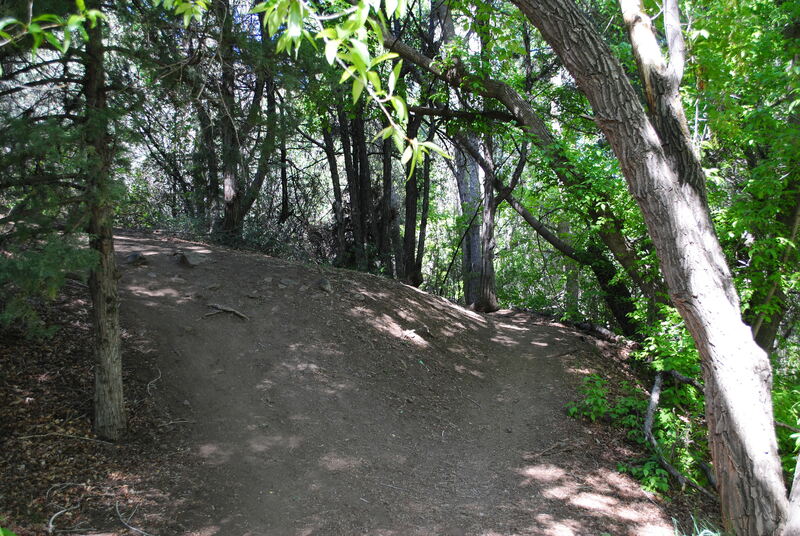 Many mountain bikers ride this trail from east to west, from higher elevation to lower.” I know lots of mountain bikers that might enjoy this trail. Every section of this hike that I saw was just beautiful. 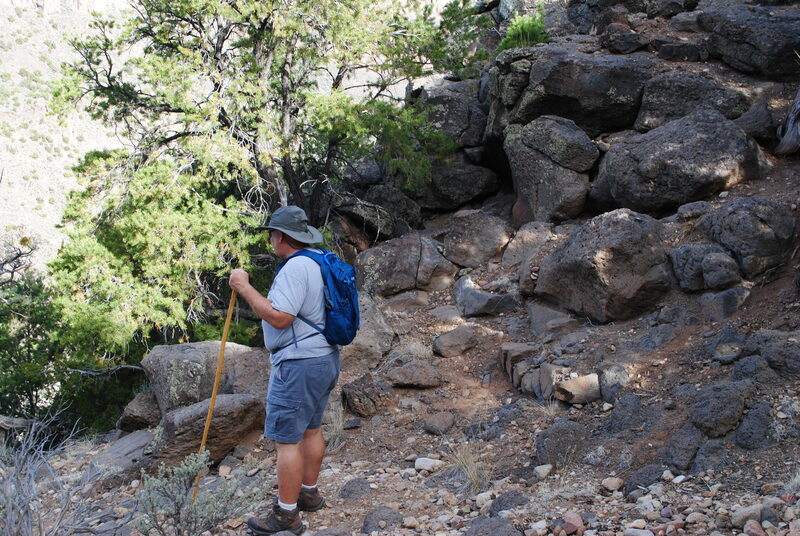 But now, I have to be completely honest here, we didn’t hike the full 20.8 miles of this trail. No, I’d have to be a crazy woman to tackle a hike like that. Ha! 🙂 But we did hike 1.6 miles of it. 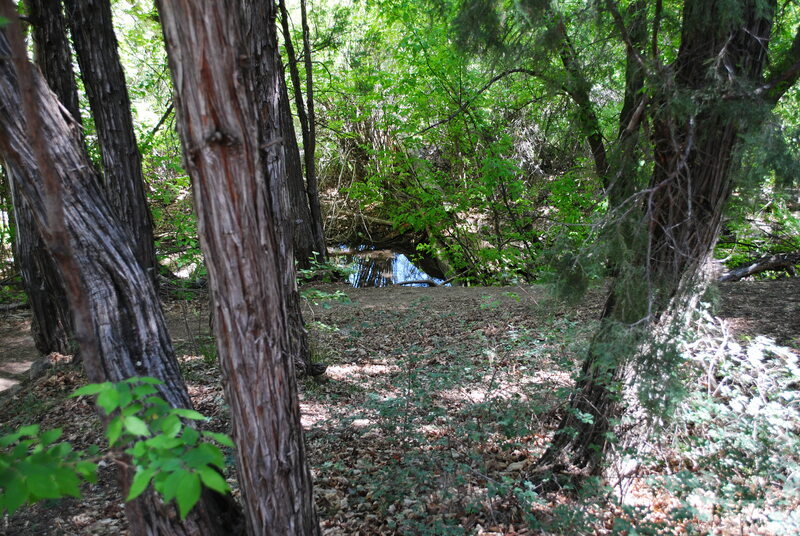 This next picture shows the spot where I sat down in the shade, and declared that spot “my summit spot for the day”. 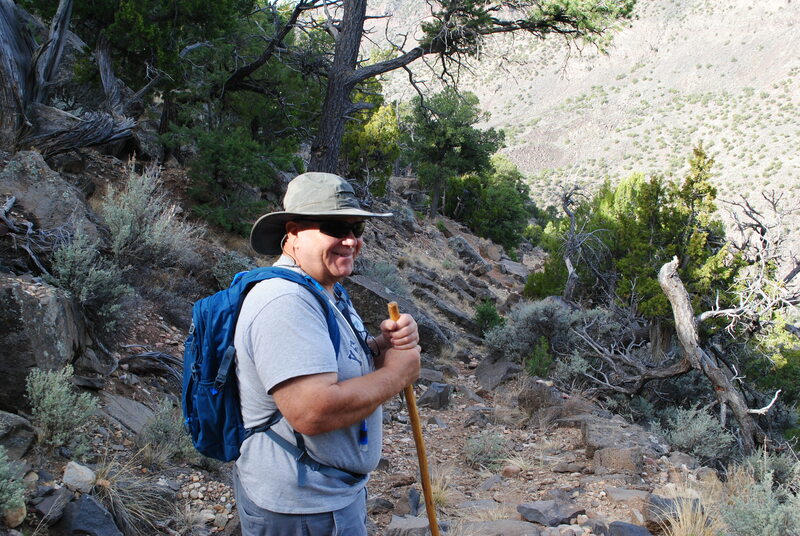 Hiking is a favorite past-time for Bill/Papa and I. 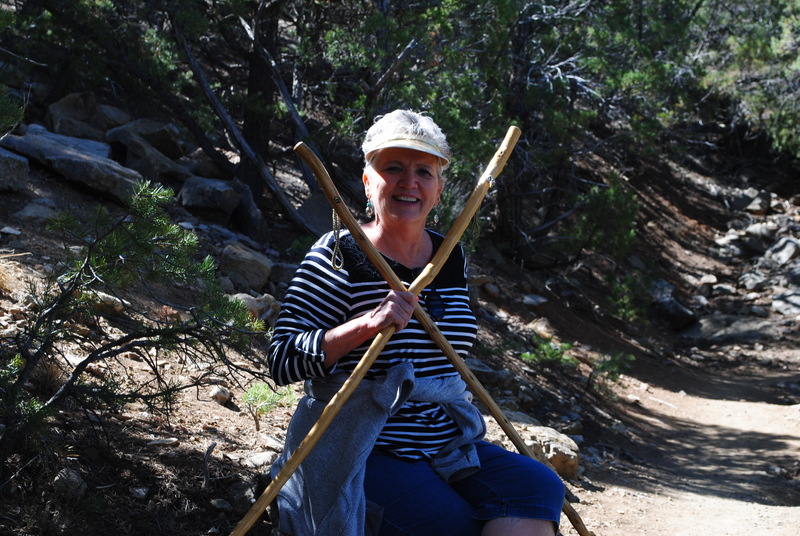 It felt good to be out hiking a fun trail again, even if we only hiked a small section of the much longer trail. For me, it’s not how far we go, it’s that we go as far as we want, and that we have fun while we’re out there. 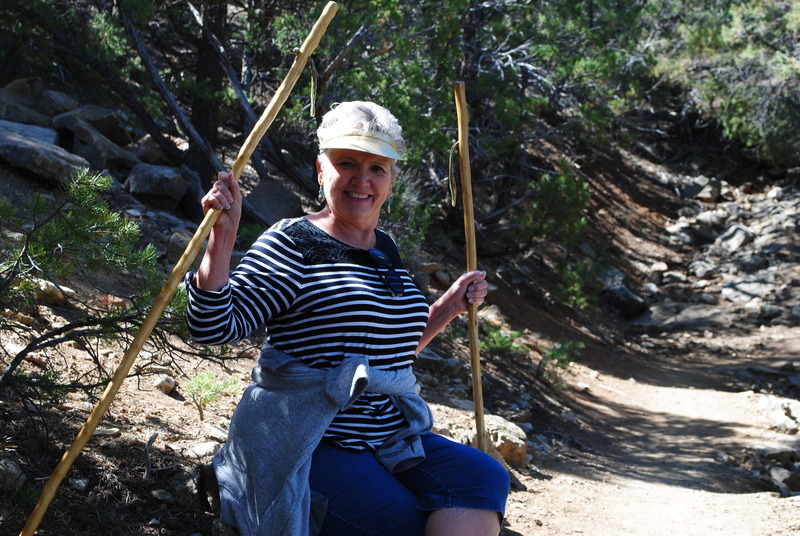 We try to stay as active a we can, and we’re hoping that will enable us to keep doing all the things we love to do, and living this retirement dream we’re loving so much. 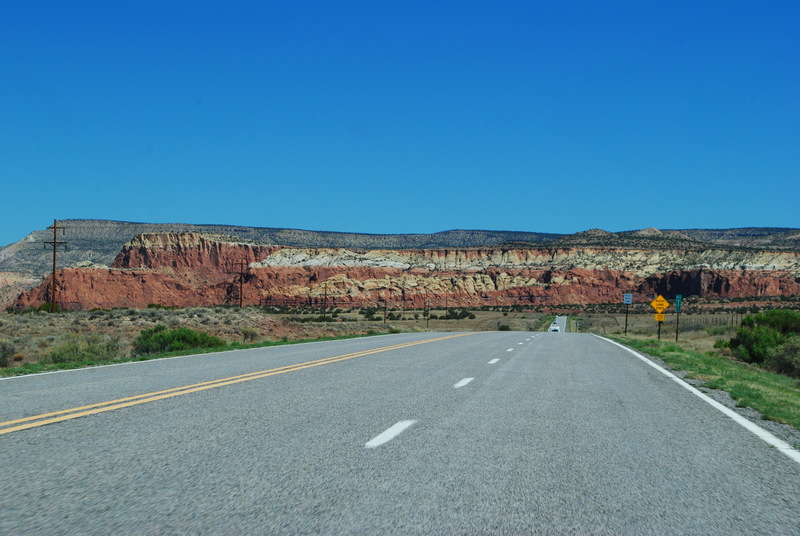 We loved driving through the Enchanted Circle, in New Mexico, so much so, we decided to do it again. 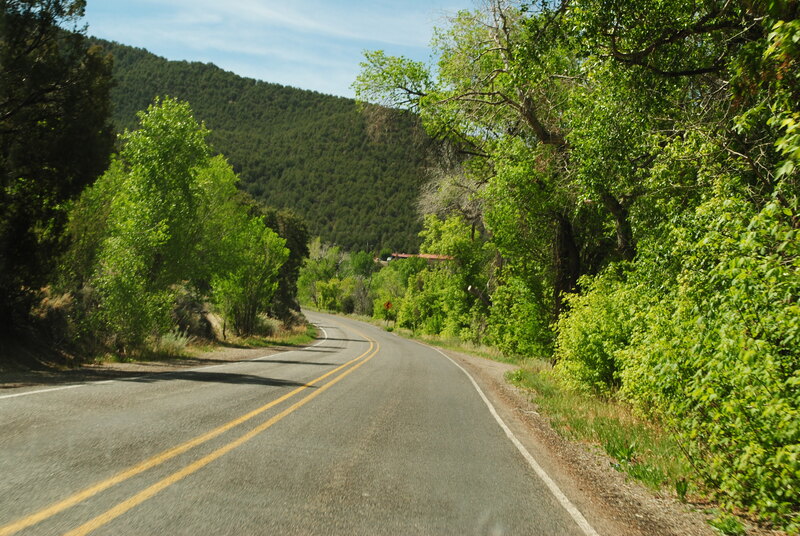 But this time, we started from Taos instead of Questa. The scenery is so beautiful, I could never get tired of looking at it. 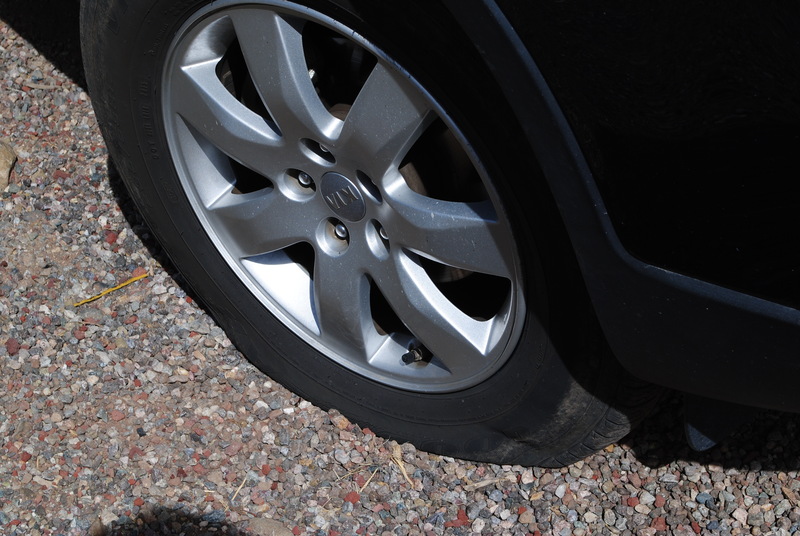 Well, not far into our trip, we had an “adventure” in the form of a flat tire. However, as Bill/papa was changing the flat tire, a very nice, older gentleman, stopped just to see if he could be of any help. 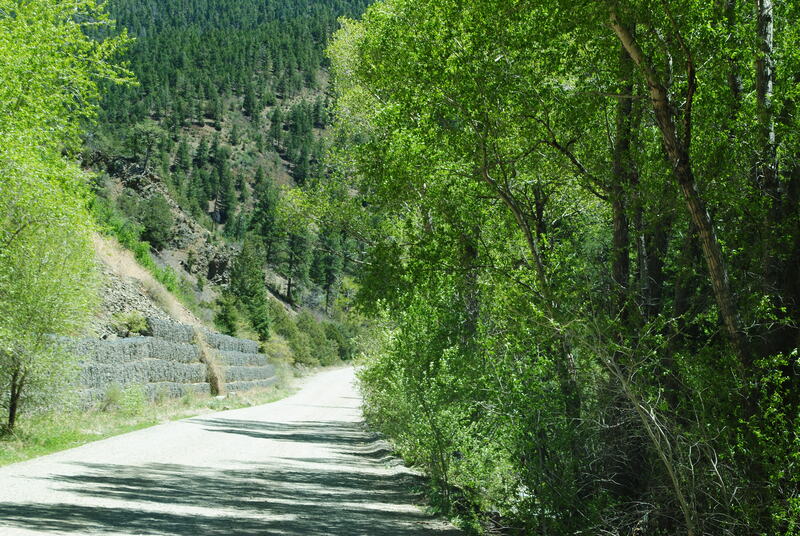 Then, he gave us a great suggestion of where to go in Taos to buy some new tires. So off we went to get new tires, and while we waited, we walked next door and had lunch. Then, within 45 minutes, we were on our way again, to finish our Enchanted Circle drive. The first time we came through here (going the other way), I hadn’t noticed this house that is set up to look like a big covered wagon. I thought that was very cool looking. 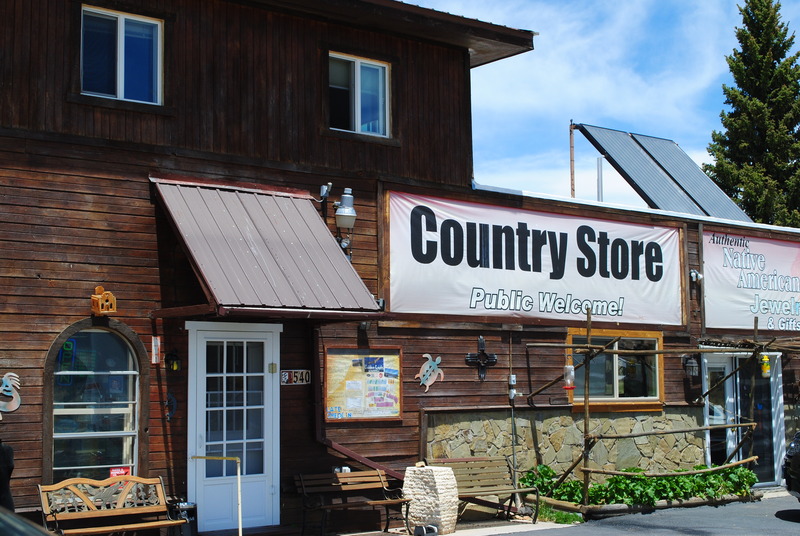 I love little country stores, so of course we had to stop in and check out this country store, located just outside of Angle Fire. And, oh look, they happen to need camphosts! 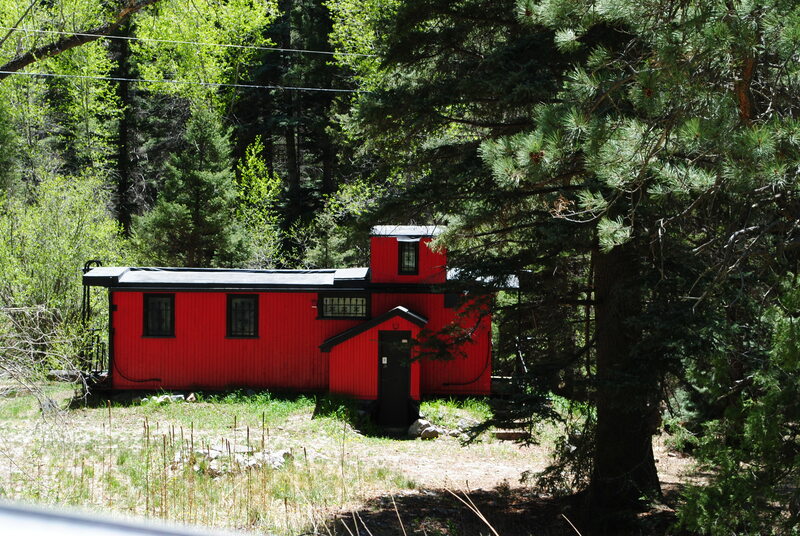 If we were looking for a hosting position for the summer, this could have been our home. 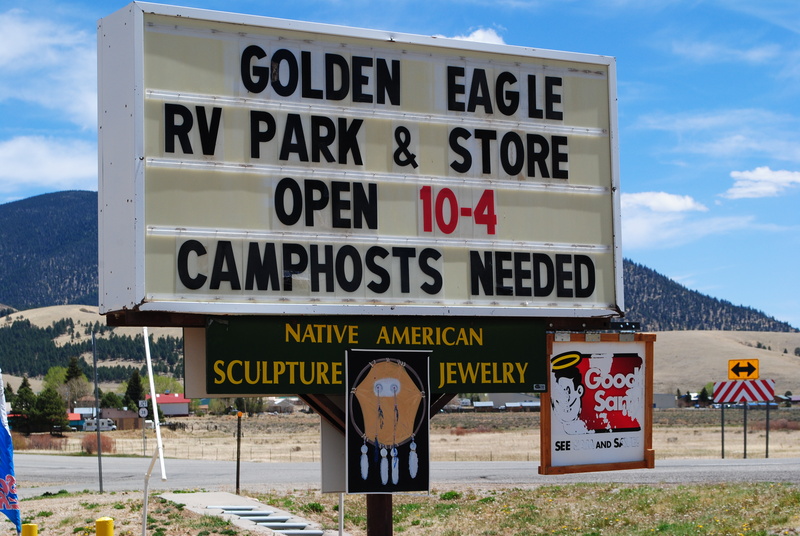 The little store had all kinds of Native American sculptures and jewelry, and they even have a small restaurant adjacent to the store. I’m glad they are looking for help, because the lack of service we saw when we were there left a lot to be desired. No one greeted us when we entered the small store, but there was a woman on the phone (on a personal call) in the back of the store and she just kept talking even while ringing up our purchase. Another woman came from the opening to the adjacent restaurant, and asked if we needed help just as we were leaving, but no one said good-bye, thank-you, or come back again… I would for sure give better customer service than that. Ha! 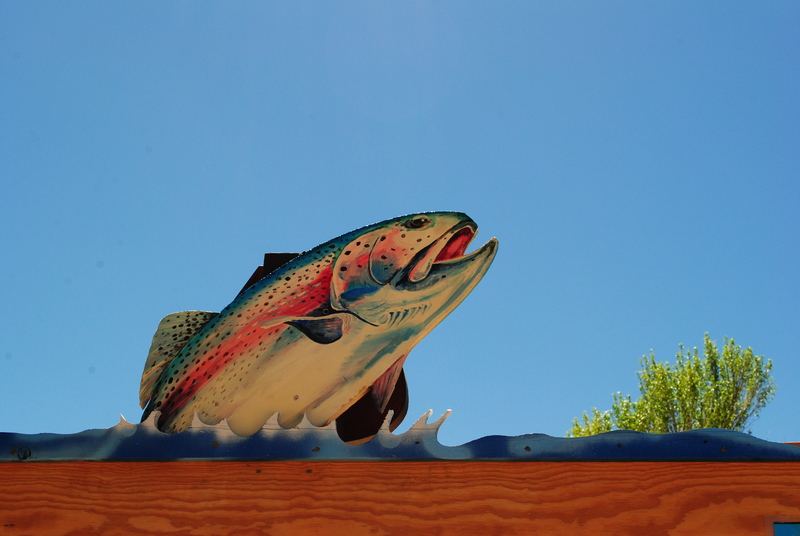 I would even be happy to cook up, and sell, all kinds of homemade goodness in that little restaurant for the folks. 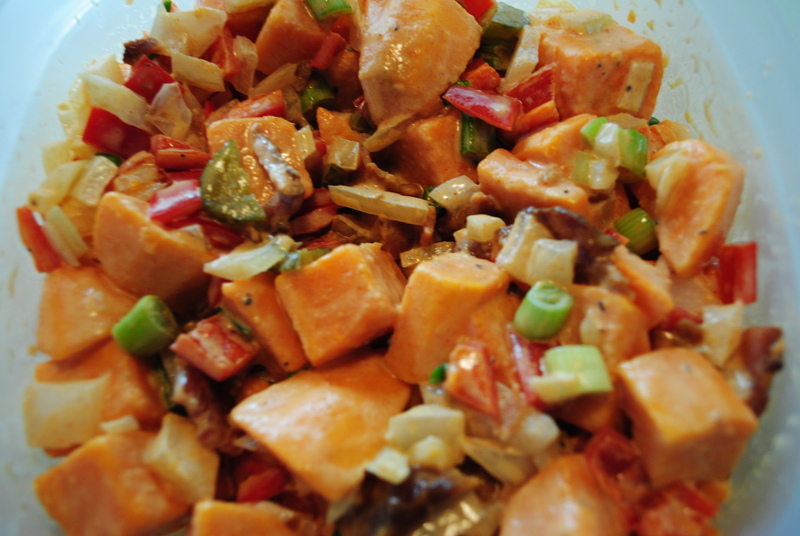 Jambalaya, anyone? 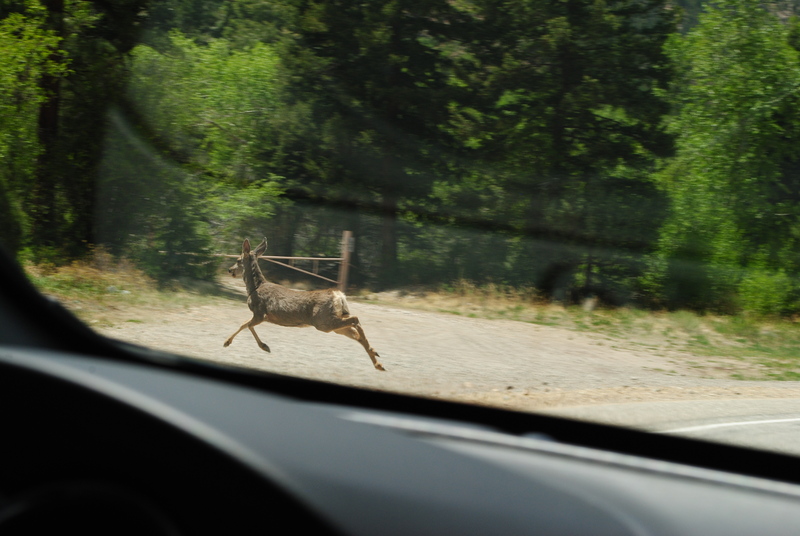 As we continued on our way, we saw two deer on the side of the road. 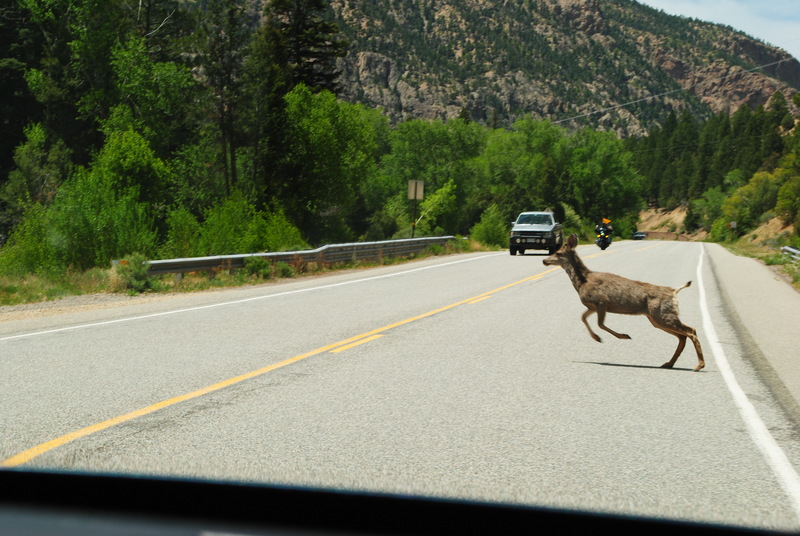 We slowed down, and one of them turned and dashed across the road right in front of us, allowing me to snap two quick pictures. 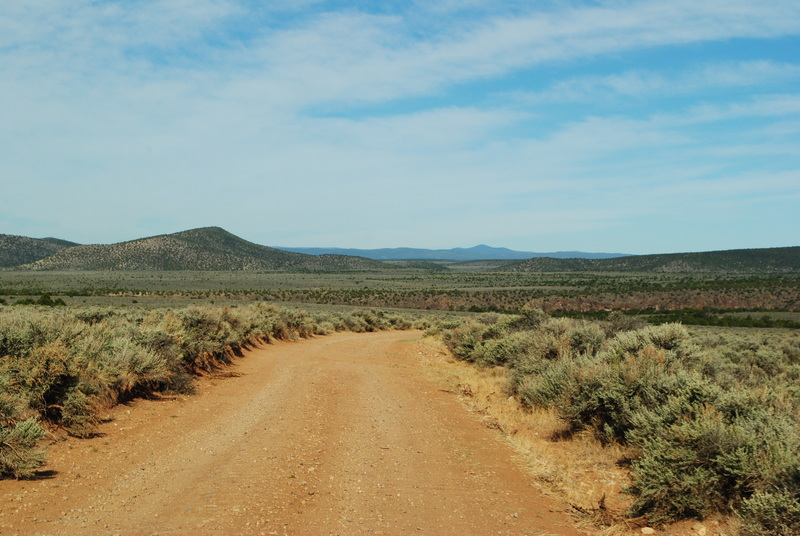 The last time we came through this area, we saw the Big Horn Sheep right here. I just love the landscape in this particular area. I find it just so, so, beautiful. Another fun-filled day on our summer celebration tour. 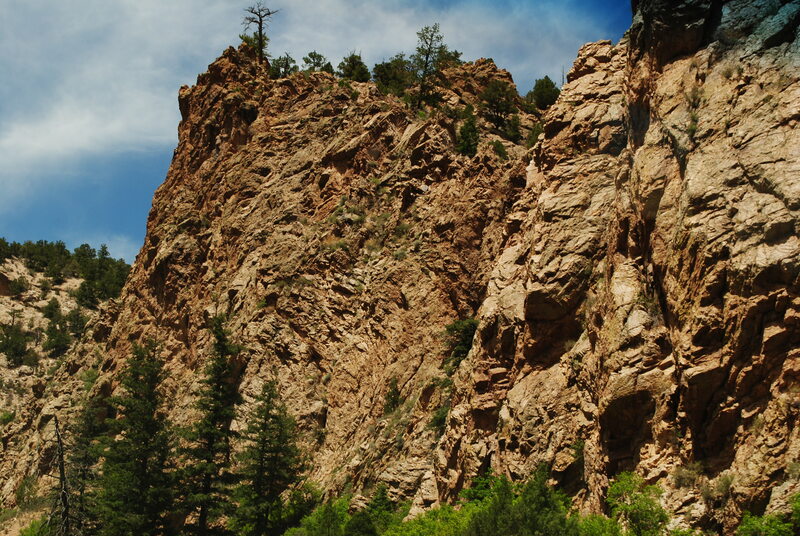 I’ve been having problems adjusting to the altitude change since we arrived in Questa, New Mexico. We’ve been here just over two weeks now, and I have been itching to get out and do some real hiking. 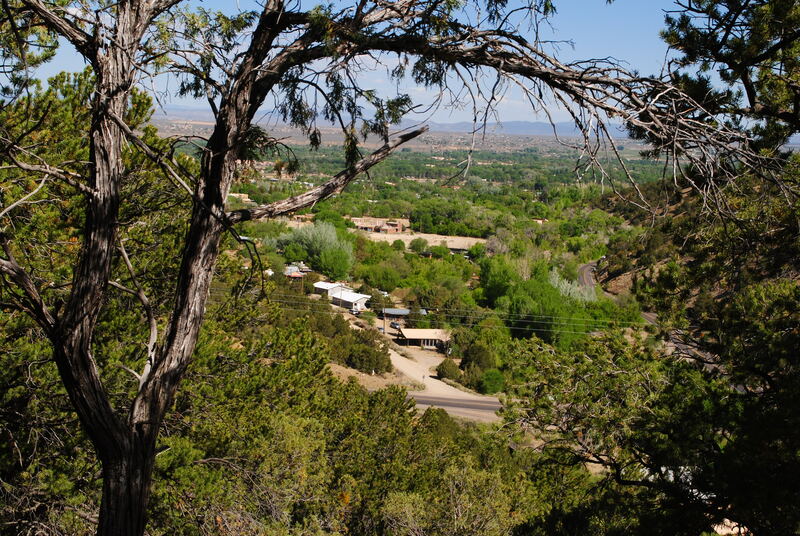 The past few days, I started feeling like I might finally be adjusting to the altitude, since I was able to take a deep breath while walking around the campgrounds, and/or when we were in town etc. So I told Bill/papa that I thought I might be ready to try taking a short, but real hike. 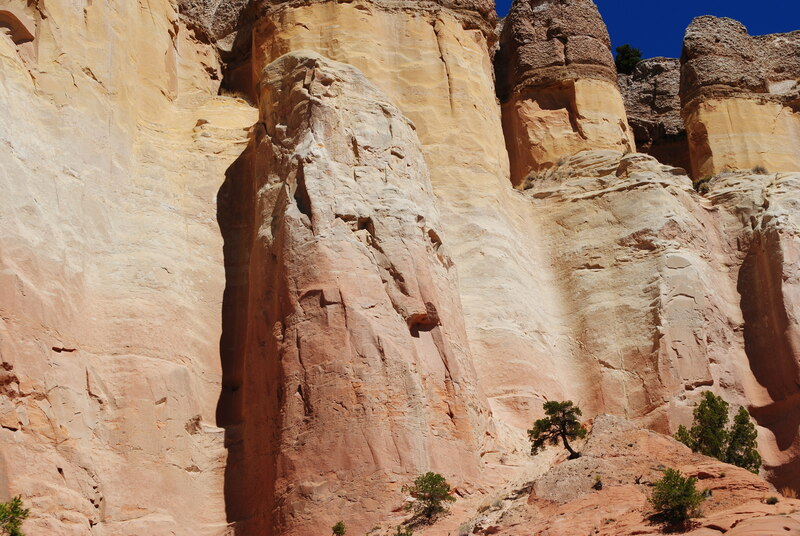 We went to the local Ranger Station and asked for a list of local hikes. We were given 20 pages of hikes to choose from. 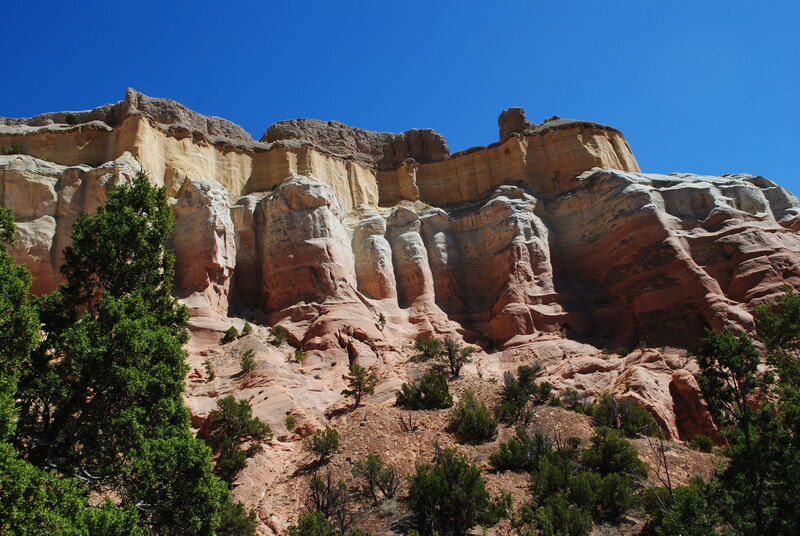 One or two of them stated the hike was “novice to intermediate” and the rest were listed as “moderate, moderate to difficult, difficult, or expert hikes. Well, come on now I thought to myself, I walk or hike all the time in Arizona, so I certainly think I can do more than a “novice to intermediate” hike. Bill told me to pick the hike I thought I was going to be able to do based on how I was feeling with the altitude issues. 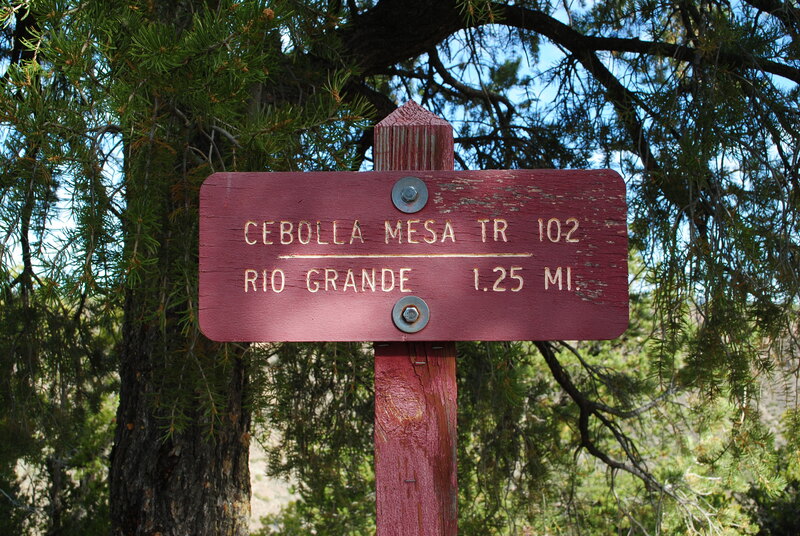 I decided on the Cebolla Mesa hike. 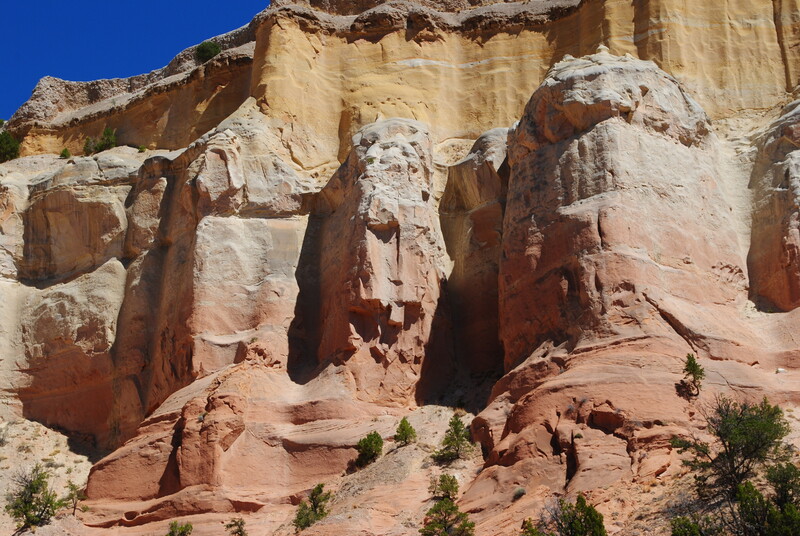 It is listed as a moderate hike and is only 1.25 miles long. 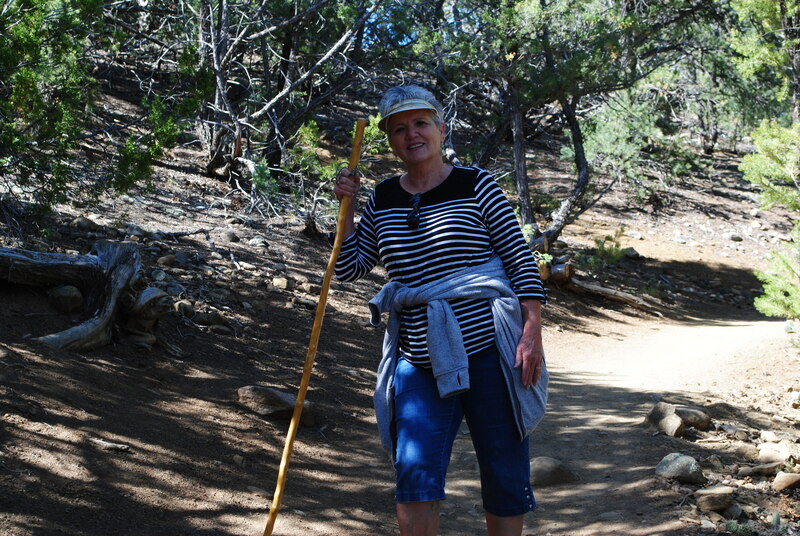 The actual description of the hike read ” this trail is moderately strenuous to the confluence of the Rio Grande and Red River. 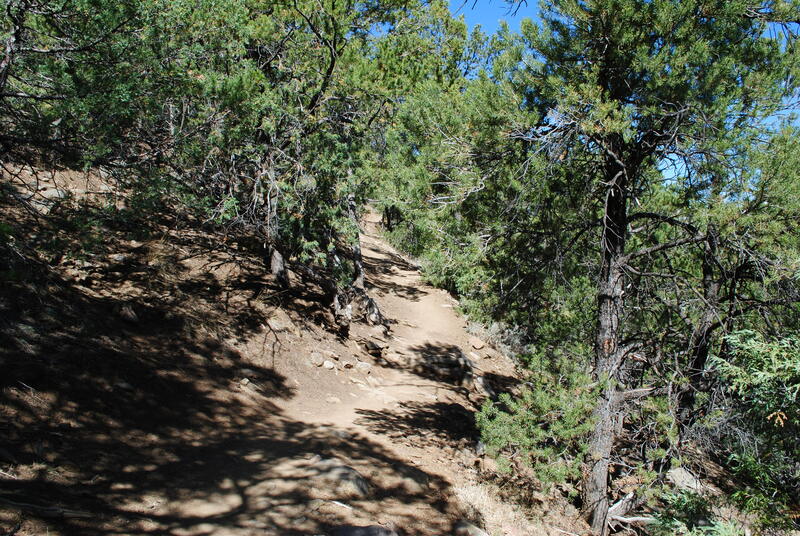 The trail is steep and rocky, at the top, then switching to moderately steep with 22 switchbacks. 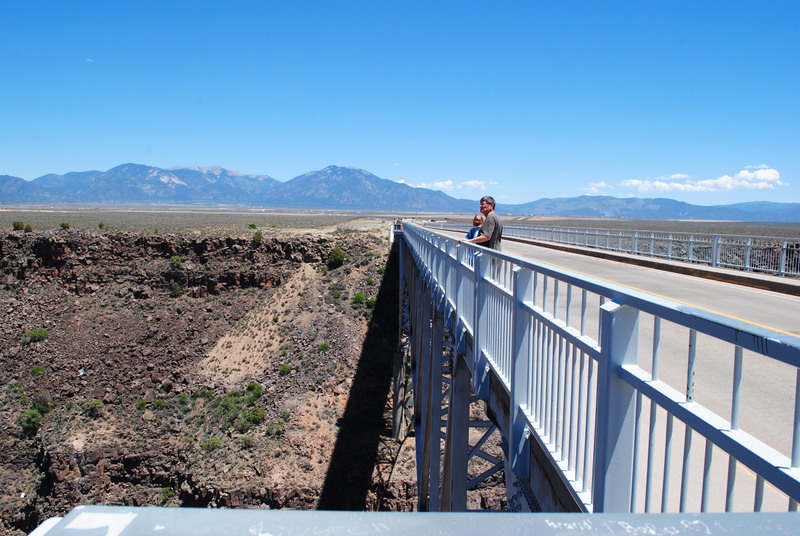 The views of the gorge and the desert landscape are spectacular”. What on this earth would ever make that sounded easy enough to me to start out with? STUPID comes to mind!! The altitude must have really affected my brain, and clouded my normally good judgement. 22 switchbacks, I don’t even like switchbacks when I’m in a car! Mix in the fact that I have a PROFOUND fear of heights, and I for sure had the perfect set-up for a close call with disaster!! Oh, the views were “spectacular” at least what I could see of them seeing how I was too busy climbing over boulders and slipping and sliding along steep cliffs..
Then we hit the next switchback, and I looked at the huge rocks, and steep slopes, and thought, “oh, HeLL, NO” if I go down there any further, that will for sure become my final resting place. I somehow had enough sense left to know I was never going to make it back out of there alive..
And not one minute to soon did I make that decision, because the climb back to the top was slow and painful, and I felt like I had an elephant riding on my back every step of the way. 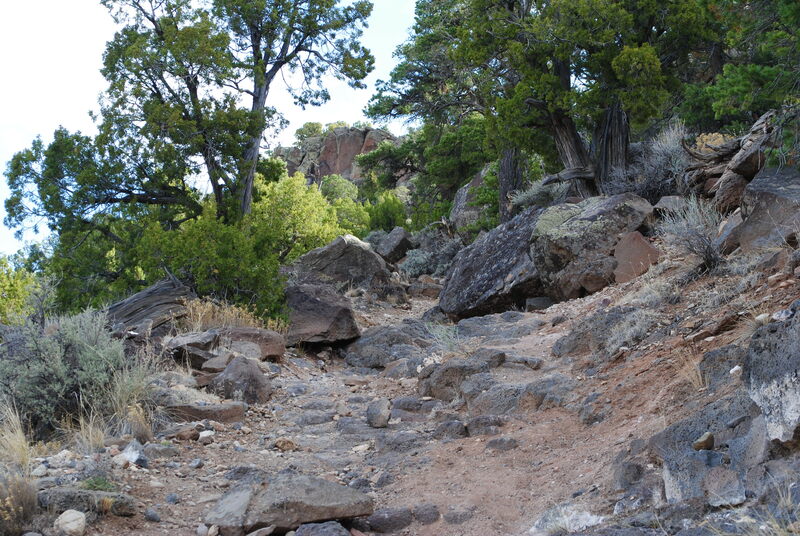 I am convinced we are lucky we didn’t make it to the bottom of that trail. 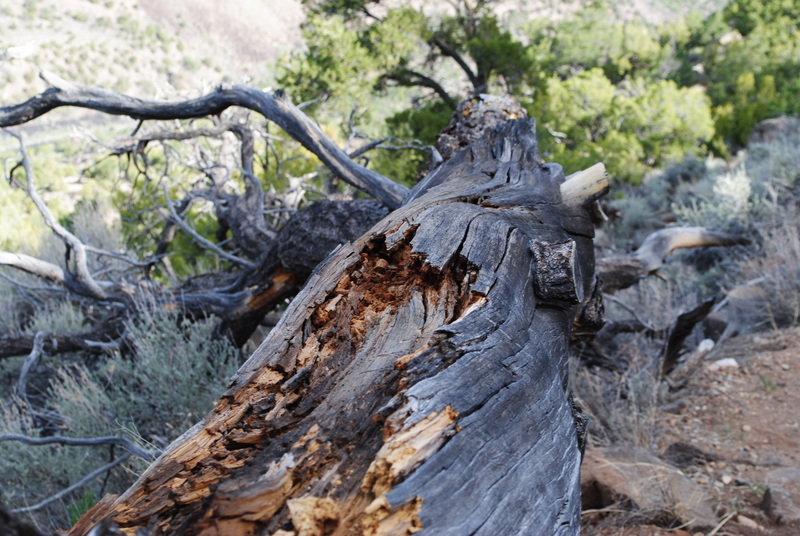 Because, let me tell you, when we finally made to back up out of there from the point where I decided I couldn’t go on, I was as spent as this dead tree, that also gave up the spirit, and the “I can do it attitude”, and just laid over. I now have a very healthy respect for altitude changes, and what it can do to your body, and your attitude. Ha! As Bill/papa always says when things don’t go as expected… “we had an adventure”. That for me was an adventure I won’t be repeating anytime soon. 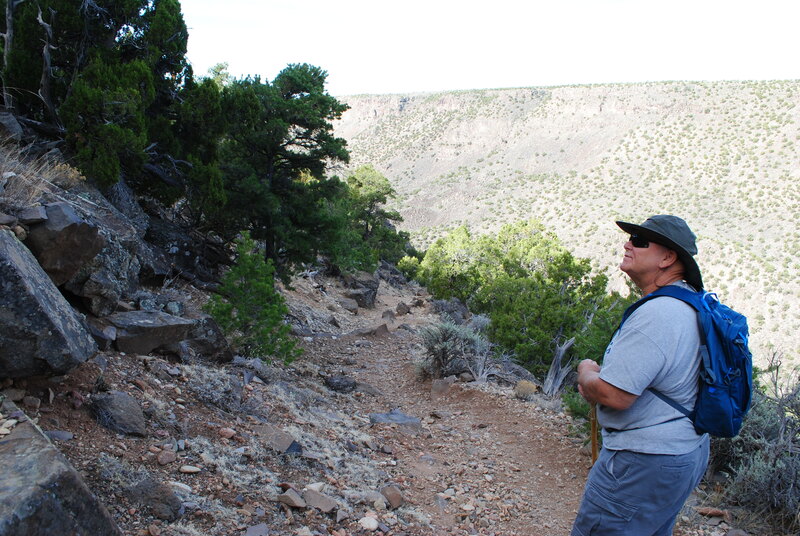 After attempting that hike of doom, we found out there are other, more “normal”, hikes around the Taos day use areas. They aren’t even listed on the hiking list we got from the local Ranger’s Office. What’s up with that? Perhaps next week we will go check out some of them.